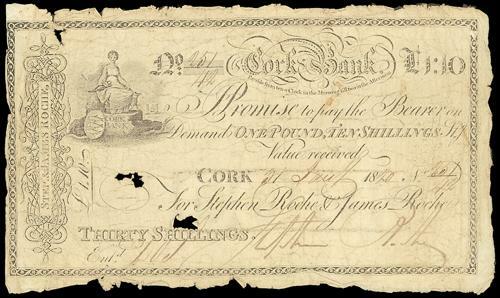 Roche's Bank note 1 pound and 5 shillings from 1817. Last edited by ThePloughman on 04 Dec 2017 22:12, edited 1 time in total. The notes of this Bank are attractively designed. Here is an unissued 1.5 Guinea note from the early 1800's. Last edited by DOC on 09 Aug 2018 22:23, edited 1 time in total. That is a nice note, and in good grade too. Another wierd denomination. I guess usage determined what denominations were printed. I have a Cork Bank £1 note from 1834 (Leslie's) any idea of value or rarity ? Post a picture of it, and we'll see. Kind of odd they'd change the design so completely. Maybe they had problems with forgeries. Two nicely designed notes tho. 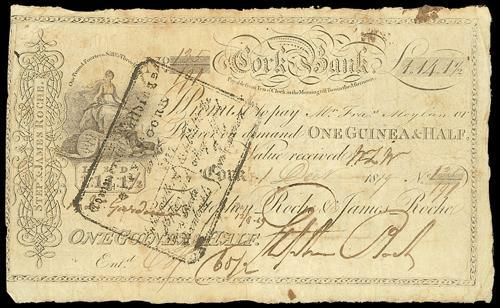 Cork Bank One Guinea note. 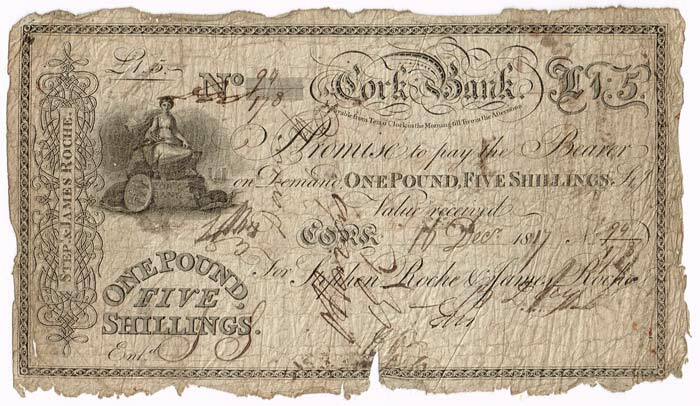 A Cork Bank 30 Shillings from 1820. Here is a £1 dated 1st Feb.1818. Last edited by DOC on 09 Aug 2018 22:28, edited 1 time in total. I found a pic of an issued 1 Guinea and half note, I think the date on it is 1814. Here is a 9 Shillings note dated 1800 from this partnership. A nice design with the the partners initials top left and bottom left. Here is a scarce issued example of a 3 Guineas note from this partnership, dated 1st Dec.1818. that's a very attractive banknote, and another odd denomination — 3 Guineas! The viginette on the two bills above are quite different from the others posted. I guess that shows 3 basic designs for the bank. Well spotted. It looks like that are 3 basic designs for the vignettes. The fortresses and ship appears to be missing from the right side of the 1 Guinea notes. However, I do not have a detailed enough scan of a 1 Guinea note to prove this beyond doubt. If anyone has an example of this note, it would be interesting to see the detail of the vignette. 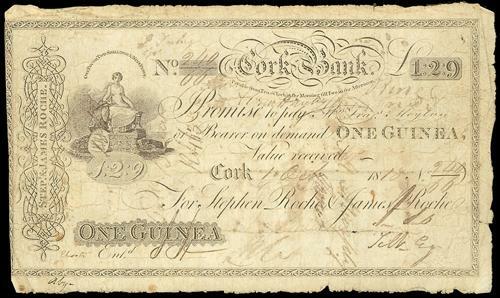 Here is a 4 Guinea issued note, dated 24th July 1818 and signed by lead partner, Stephen Roche. This is the highest denomination that I have seen for this bank. Nice denomination. I've not seen one before. Supposed to be a £5 note also. Yes, PMI mentions a £5 note, so someone may be able to provide a picture . It seems likely that a 5 Guinea denomination would also have been issued.